There’s a 2016 Land Rover Range Rover on sale in England with just 3,200 miles on it that’s owned by a little old lady. A little old lady who happens to be the Queen. 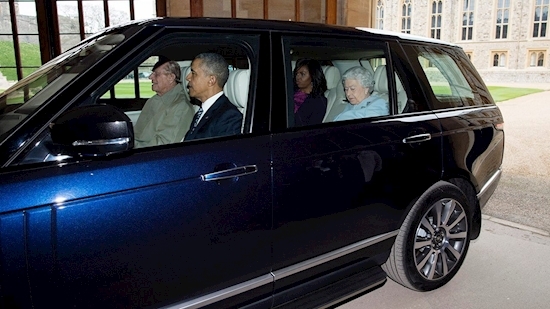 The blue SUV is from the Royal Household's fleet, and was used by Queen Elizabeth and Prince Philip to pick up Barack and Michelle Obama from the Windsor Castle landing area when they dropped in by helicopter in 2016. According to The Sun, it’s was never bulletproofed, but the listing at Bramley Motor Cars says that it once had a siren that has since been removed. So were a step and grab handle that had been installed to make it easier for the petite monarch to climb up into the vehicle. The vehicle is in excellent condition, unlike another one of the family’s Land Rovers that was involved in an accident in January with Philip behind the wheel. The price for the new one, which is in top spec Autobiography trim, is listed at £129,000, or roughly $170,000. Considering the limousines used by American presidents are never resold to the public, this may be the only chance to buy a car used by one and a royal, let alone at the same time.